Notable literacy expert Dr. Timothy Shanahan presented the “Literacy and the ACT” workshop, Sept. 17-18, at Shawnee State University in Portsmouth for area English Language Arts teachers. Dr. Shanahan is Distinguished Professor Emeritus at the University of Illinois at Chicago where he was Founding Director of the UIC Center for Literacy. Previously, he was director of reading for the Chicago Public Schools. He is author/editor of more than 200 publications on literacy education. His research emphasizes the connections between reading and writing, literacy in the disciplines, and improvement of reading achievement. Thirty-two teachers from 18 local school districts participated, including Bloom-Vernon, Dawson-Bryant, Green, Jackson City, Manchester, Minford, New Boston, Northwest, Notre Dame, Oak Hill, Piketon, Portsmouth City, Scioto County Career Technical Center, Sciotoville Community, Valley, Washington-Nile, Wellston City, and Wheelersburg. Noah Fannin teaches an ACT class at Portsmouth High School and his wife, Sara, teaches English classes at Green, and they both attended the workshop. Noah Fannin said Dr. Shanahan focused much of his attention on reading comprehension and vocabulary. “He (Shanahan) talked about different ways to teach vocabulary in the class, and not just give the kids a list and the definitions. How to use the words in context, and how to use the clues around the word, rather than just focusing on the word,” Fannin said. 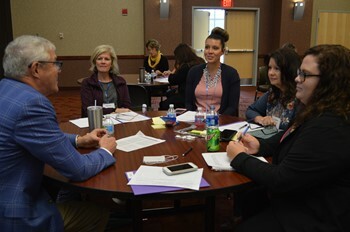 On the second day of the workshop, Shawnee State University English Department faculty members joined the high school teachers in discussions about ways to better prepare students for the ACT Test and for college level classes. English Language Arts teachers Amanda Crabtree (Valley High School), Danielle Cook (Piketon High School) and Julie Haines (South Webster High School) gave presentations to their peers about methodologies with which they have had great success in their own classrooms. Teachers are already successfully employing the skills they learned during the workshop. Fannin said his students scored very well on a vocabulary quiz delivered after he tried some of Shanahan’s techniques. Sharee Price, Gifted Services coordinator at the South Central Ohio Educational Service Center, partnered with Patricia Spradlin, director of the Teaching and Learning Center of Shawnee State University, to facilitate the workshop. The event was funded primarily through a grant obtained by Price from the Scioto Foundation. For more information about CAPE and the ESC, visit online at www.scoesc.org, or follow on Facebook, YouTube, and Twitter.